The Confetti large pendant ceiling ceiling light, a superb quality old silver finish fitting, supplied by Elstead Lighting and designed by Quoizel. The Confetti collection features confetti-like metal chips encompassing an inner off-white linen shade. The old silver finish and frosted diffuser completes the design of this funky contemporary series. The large four-light pendant is suspended from a circular 14cm diameter old silver finish ceiling mount and central drop rod. 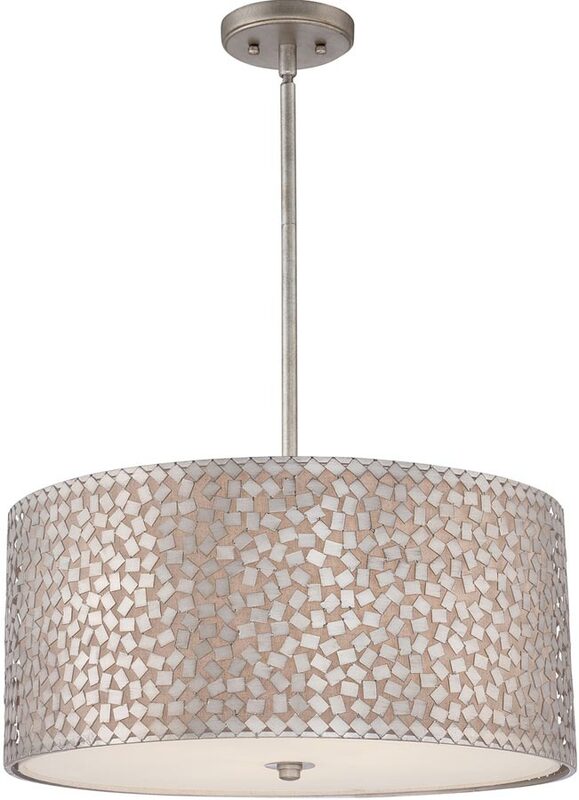 It has an outer shade decorated with confetti like chips, inset with an off-white linen fabric inner shade and fitted with an etched bottom diffuser for a softer light. Supplied with two 15cm and two 30cm drop rods that can be used individually or in any combination to achieve the desired height. Please see technical data below for minimum and maximum drop dimensions. 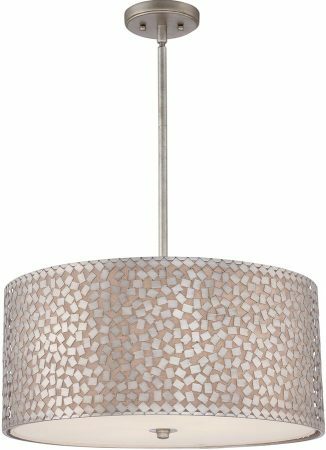 An understated contemporary ceiling pendant that provides a soft yet stylish look for almost any room and provides warm and inviting accent lighting. Designed by Quoizel, founded in 1930 in New York. They relocated to Charleston in 1996 where they remain to this day. They remain a privately held, family-owned and operated business. Quoizel products are now being introduced to the UK market and have quickly built a reputation for their diverse, unique and fresh designs.